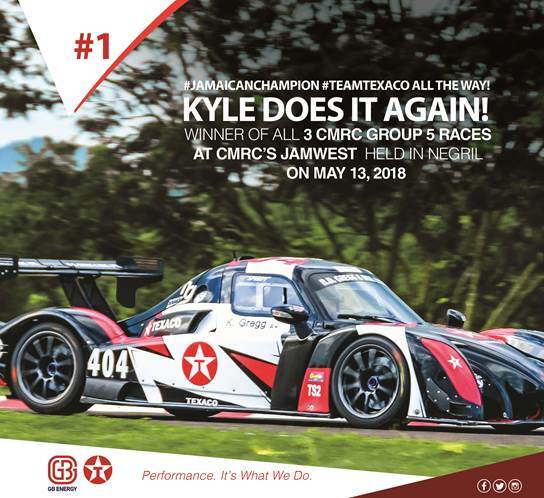 GB Energy – Texaco Jamaica race car driver Kyle Gregg wins again! Our beloved race driver Kyle “Speedy” Gregg, after kicking off the racing season on April 2 at the Dover Carnival of Speed in St. Ann, proceeded to win the Thundersport II Category event. Now, he has succeeded in maintaining his winning streak at the Jamwest International Racemeet scheduled this past May 13th, in Negril, Westmoreland! Kyle won, not one, but all 3 CMRC GROUP 5 RACES! #TeamTexaco Driver, GO Kyle Greg!